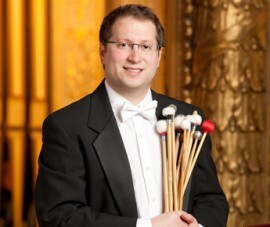 Daniel Bauch joined the Boston Symphony Orchestra in fall 2009, having held the position of assistant principal timpanist and percussionist with the Detroit Symphony for three years. He began playing percussion at age seven and during high school studied with the BSO’s Timothy Genis and Will Hudgins. Mr. Bauch earned a bachelor’s degree from the Juilliard School in 2002 under the tutelage of Daniel Druckman. While in New York he performed in concert with pianist Maurizio Pollini as part of a Carnegie Hall Perspectives Series, premiered a new work by Osvaldo Golijov with Dawn Upshaw and the Orpheus Chamber Orchestra in Carnegie Hall, and recorded a CD with the New York New Music Ensemble released on Albany Records. Mr. Bauch earned a master’s degree from Boston University, studying with Timothy Genis, and following graduation was offered a position on the faculty at BU, where he remained for two years. In Boston, he frequently performed with local contemporary music ensembles and appeared as a soloist with the Alea III ensemble. He has been a guest performer with the New York Philharmonic, Boston Symphony, Boston Symphony Chamber Players, Boston Ballet, Marlboro Festival Orchestra, Hartford Symphony, Springfield Symphony, and the Orpheus Chamber Orchestra. Mr. Bauch is also a founding member of New Music Detroit, a contemporary chamber group comprised of Detroit Symphony players. He has attended the Music Academy of the West festival in Santa Barbara and was a Tanglewood Music Center percussion fellow in 2001 and 2002. Mr. Bauch has presented masterclasses both in the US and abroad, and currently serves during the summer as the percussion faculty member for the Young Artist Orchestra.